Smart speakers, for those that don’t know, are speakers that can be operated by the voice. A virtual assistant – in this case Alexa – listens for the wake word, and will follow the instructions that follow, be that playing an album, telling you the weather or giving you a news update. The Echo Dot is confusingly both Amazon’s entry-level device in this space and the pick for audiophiles everywhere. The reason for this seemingly contradictory statement is that although the original Echo Dot didn’t have much of a speaker at all, it had a 3.5mm audio jack in the back, letting owners connect it to any other sound system, whether it cost £10 or £10,000. The Echo Dot maintains that raison d'etre, but improves things along the way for people who don’t want to connect it to another sound system. Not only does it look more stylish, but on a technical level it now boasts a 1.6in speaker inside, compared to the original’s 0.6in tweeter. The original Echo Dot looked like someone had sawed off the very top bit of the original Echo. Given current Echoes look nothing like the first generation model, the only real surprise is that it’s taken Amazon a year to catch up. So, it’s still a puck, but it’s a bigger puck: both taller and wider, with dimensions of 99 x 99 x 43mm, compared to the previous generation’s 84 x 84 x 32mm. It’s also nearly twice as heavy, coming in at a chunky 300g to the original’s 163g. But added heft isn’t the only change: gone is the cheap-looking plastic casing of the original, replaced with curved fabric around the outside. The top is still plastic, but it’s curved, and feels almost rubbery to the touch. It’s also lost the ostentatious Amazon logo, which is good news for those of us that don’t want a reminder that we’re funding Jeff Bezos’ lavish lifestyle every time we glance up. It maintains the four buttons on top – volume up, volume down, a button to trigger Alexa, and a button to mute the mic for privacy – as well as the blue ring that lights up when it hears the wake word. Flip it around, and you’ll still find an area cut out for an audio connector and the power source – only it’s no longer micro USB, but the same kind of power connector you get with the larger Echo devices. It’s a classy new look, in other words, although given the first one was small, compact and easy to stow away behind sound systems, most people shouldn’t care too much either way. You could use the original Echo Dot as a standalone speaker, but only a masochist would. The 0.6in tweeter inside was only really good for voice only, with a reedy output just about sufficient for audiobooks and podcasts. That was fine: it was designed to be connected to other speakers, either via Bluetooth or audio cable. The good news is that the 2018 Echo Dot makes a solid little speaker in its own right, thanks to the 1.6in speaker now packed within. The reedy, prone-to-distortion audio of the original is gone, and the overall sound feels more bassy, warm and generally richer. It also goes a hell of a lot louder, though you don’t want to push this: it’s still just a 1.6in speaker, not a club-grade sound system. I don’t want to overstate the quality, because it’s likely that any dedicated sound system you own will be better than the 2018 Echo Dot’s output, and you should make pairing it with another system a priority if you have one. 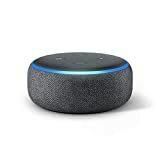 But the point is that the original Echo Dot was an assault on the ears when used as a standalone speaker, with sound more akin to a radio alarm clock than a proper HiFi setup. The 2018 Dot provides sound that’s definitely listenable, and on a par with your average £30 - £40 Bluetooth speaker. It’s more than adequate for a small room where you just want to have Alexa on tap without needing to splash out. Like the Kindle before it, Amazon has taken a great product that didn’t really need improving, and somehow made it better in every way. It looks classier and it sounds significantly better, with all the same perks that made the original Dot such a compelling product. That said, if you already own a Dot or two, there’s not much reason to upgrade, as long as they’re connected to an external speaker. And if they’re not, you’re still probably better off spending your money on a £50 speaker to boost the sound, rather than starting afresh with the 2018 Dot. If you haven’t already tried a smart speaker, and aren’t creeped out by the whole listening device thing, then this is the entry-level product to buy. It was already the best way of dipping a toe in the world of smart speakers, thanks to Google cheaping out on an audio port on the Home Mini, but now it’s even better. And at the same attractive price, too. Amazon’s done has it again.